The Constitution of the Philippines (Filipino: Saligang Batas ng Pilipinas) is the constitution or supreme law of the Republic of the Philippines. Its final draft was completed by the Constitutional Commission on October 12, 1986 and was ratified by a nationwide plebiscite on February 2, 1987. Three other previous constitutions have effectively governed the country in the past: the 1935 Commonwealth Constitution, the 1973 Constitution, and the 1986 Freedom Constitution. The earliest constitution establishing a "Philippine Republic," the 1899 Malolos Constitution, was never fully implemented throughout the Philippines and did not establish a state that was internationally recognized, due in great part to the impending American occupation during its adoption. Ruling by decree during the early part of her tenure and as a president installed via the People Power Revolution, President Corazon C. Aquino issued Proclamation No. 3 on March 25, 1986 which abrogated many of the provisions of the then 1973 Constitution adopted during the Marcos regime including the unicameral legislature (the Batasang Pambansa), the office of Prime Minister, and provisions which gave the President legislative powers. Often called the "Freedom Constitution," this constitution was only intended as a temporary constitution to ensure the freedom of the people and the return to democratic rule. A constitutional assembly was soon called to draft a new constitution for the country. The Constitutional Commission was composed of fifty members appointed by Aquino from varied backgrounds including several former members of the House of Representatives, former justices of the Supreme Court, a Roman Catholic bishop, and political activists against the Marcos regime. The Commission elected Cecilia Muñoz-Palma, a former Associate Justice of the Supreme Court, as its president. 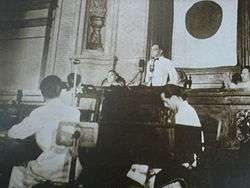 Several issues were of particular contention during the Commission's sessions, including the form of government to adopt, the abolition of the death penalty, the retention of the U.S. bases in Clark and Subic, and the integration of economic policies into the constitution. Lino Brocka, a film director and political activist who was member of the Commission, walked out before the constitution's completion, and two other delegates dissented from the final draft. The Commission finished the final draft on October 12, 1986 and presented it to Aquino on October 15. The constitution was ratified by a nationwide plebiscite on February 2, 1987. The Constitution contains a preamble and eighteen self-contained articles with a section numbering that resets for every article. Article 4 defines the citizenship of Filipinos. It enumerates two kinds of citizens: natural-born citizens and naturalized citizens. Natural-born citizens are those who are citizens from birth without having to perform any act to acquire or perfect Philippine citizenship. The Philippines follows a jus sanguinis system where citizenship is mainly acquired through a blood relationship with Filipino citizens. Article 5 provides for the qualification to vote and for a system of the secrecy of the ballot and absentee voting, and mandates a procedure for the disabled and illiterate to vote. Article 6 provides for a bicameral legislature called the Congress composed of the Senate and the House of Representatives. It vests upon Congress, among others, the power of investigation and inquiry in aid of legislation, the power to declare the existence of a state of war, the power of the purse, the power of taxation, and the power of eminent domain. Article 7 provides for a presidential form of government where the executive power is vested on the President. It provides for the qualification, terms of office, election, and power and functions of the President. It also provides for a Vice President and for the presidential line of succession. Article 8 vests the judicial power upon the Supreme Court and other lower courts as may be established by law (by Congress). While the power to appoint justices and judges still reside with the President, the President may only appoint nominees pre-selected by the Judicial and Bar Council, a body composed of the Chief Justice of the Supreme Court, the Secretary of Justice, the Chairs of the Senate and House Committees on Justice, and representatives from the legal profession. Article 9 establishes three constitutional commissions: the Civil Service Commission, the Commission on Elections, and the Commission on Audit. Article 10 pursues for local autonomy and mandates Congress to enact a law for the local government, now currently the Local Government Code. Article 11 establishes the Office of the Ombudsman which is responsible for investigating and prosecuting government officials. It also vests upon the Congress the power to impeach the President, the Vice President, members of the Supreme Court, and the Ombudsman. Article 12 sets a framework for an economy that is effective controlled by Filipinos. These include requirements that at least sixty percent of corporations be owned by Filipinos. The original 1935 Constitution provided for unicameral National Assembly and the President was elected to a six-year term without re-election. It was amended in 1940 to have a bicameral Congress composed of a Senate and House of Representatives, as well the creation of an independent electoral commission. The Constitution now granted the President a four-year term with a maximum of two consecutive terms in office. While the 1973 Constitution ideally provided for a true parliamentary system, in practise, Marcos had made use of subterfuge and manipulation in order to keep executive powers for himself, rather than devolving these to the Assembly and the cabinet headed by the Prime Minister. The end result was that the final form of the 1973 Constitution – after all amendments and subtle manipulations – was merely the abolition of the Senate and a series of cosmetic rewordings. The old American-derived terminology was replaced by names more associated with parliamentary government: for example, the House of Representatives became known as the "Batasang Pambansâ" (National Assembly), Departments became "Ministries", and their cabinet secretaries became known as "cabinet ministers", with the President's assistant – the Executive Secretary – now being styled the "Prime Minister". Marcos' purported parliamentary system in practise functioned as an authoritaritan presidential system, with all real power concentrated in the hands of the President but with the premise that such was now constitutional. ↑ 1987 Constitution of the Philippines, art. 6, sec. 21. ↑ 1987 Constitution of the Philippines, art. 6, sec. 26. ↑ 1987 Constitution of the Philippines, art. 6, sec. 25. ↑ 1987 Constitution of the Philippines, art. 6, sec. 28. ↑ 1987 Constitution of the Philippines, art. 6, sec. 9. ↑ "Pamatong vs. Comelec (G.R. No. 161872)". Supreme Court of the Philippines. April 13, 2004. Retrieved 2007-06-09. ↑ "Oposa et al. v. Fulgencio (G.R. No. 101083)". Supreme Court of the Philippines (requoted by Lawphil.net). July 30, 1993. Retrieved 2007-06-09. ↑ "1897 Biac-na-Bato Constitution". [www.thecorpusjuris.com The Corpus Juris]. November 1, 1897. Retrieved 2009-01-25. ↑ Guevara 2005, p. 88. ↑ Guevara 2005, p. 104. ↑ On December 10, 1898, the Treaty of Paris transferred sovereignty from Spain to the United States. On March 24, 1934 the United States passed the Tydings–McDuffie Act that allowed the nation to have self-government through a ten-year transitional period in preparation for full independence. 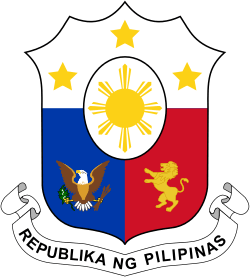 The United States recognized Philippine independence in the Treaty of Manila on July 4, 1946. ↑ In Sanidad vs. Comelec, L-44640, October 12, 1976 the Supreme Court ruled that on the basis of absolute necessity both the constituent power (the power to formulate a Constitution or to propose amendments or revision to the Constitution and to ratify such proposal, which is exclusively vested to the National Assembly, the Constitutional Convention, and the electorate) and legislative powers of the legislature may be exercised by the Chief Executive. ↑ Summary: Sanidad vs. Commission on Elections (GR L-44640, 12 October 1976), berneguerrero.com. ↑ G.R. No. L-44640 October 12, 1976, lawphil.net.